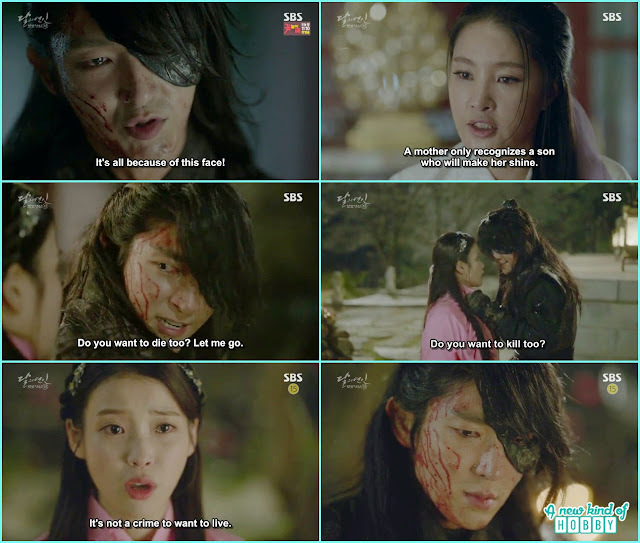 We couldn't miss to watch Moon lovers as of its our Lee Joon Gi's serial. We already watched 3 episodes and finally completed the 4th one. The 4th Prince Wang Soo after got rejected and mistreated by his mother became all heart broken and take out his frustration by making the stone tombs build by the mothers for children health and prosperity. Hae Soo happened to saw him and stopped him doing this. She also mention its very hard for the mother to built it why are you doing this here and happen to saw blood all over him. She comforted him as he is injured but the 4th prince told her that he killed people and its their blood. It was a hard reality to bear with that he wanted to have a peaceful life but his mother didn't want him to do so. He came out the palace and was sitting alone on the mountains. Hae Soo bring food for him as no one else was willing to serve him due to his bad temper people around him avoid him. It was the beautiful moment of 4th prince life for the first time he was having a meal brought by the girl who always stand boldly infront of him with out any fear and comfort him. 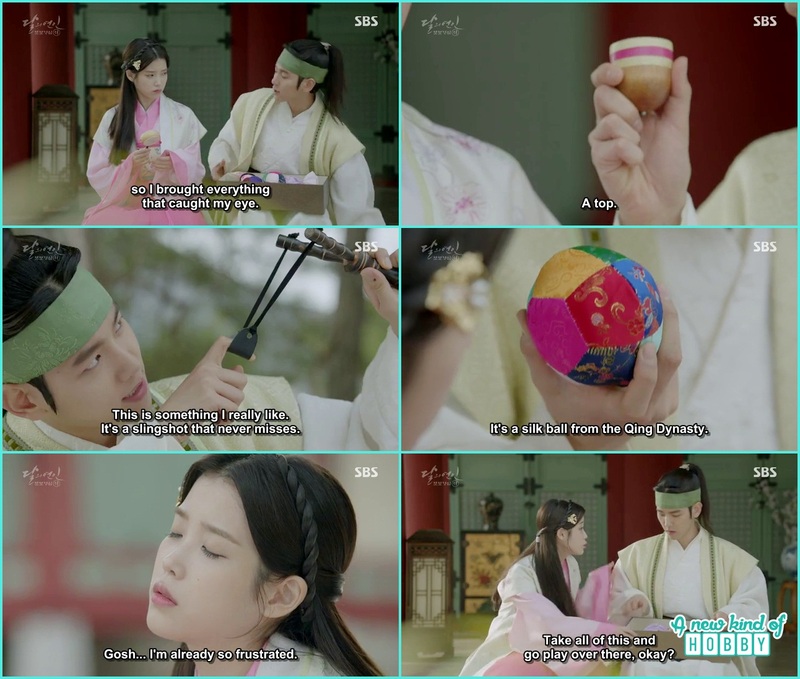 The 10th Prince bought many toys for Hae Soo as a gift to play with. But Hae Soo was in the deep thought she was worried about his sister Myung hee and the 8th prince life. She ask the 10th prince to somewhere else and play by himself as she had lot other things to worried about. The 10th prince caught on something serious Hae Soo was so desperately thinking about as he was too friendly he ask Hae Soo to share it with him. Hae Soo ask what if his wife got sick will he bring another women? He replied quickly we never expect. He was totally opposite of his father King Gwang Joo. He said he will find only one perfect women and live his whole life with her he won't become like his father marrying many women's having lot of children and having a complicated life. Hae Soo ask her maid to put the hairpin in 4th Prince room and she was caught as a thief by lady Yeon Hwa. She was the witchy in this serial. She beat the maid for stealing something. 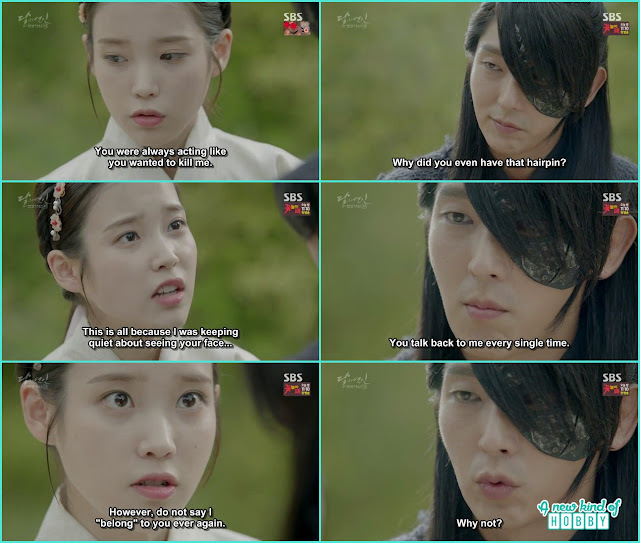 Hae soo happen top pass by and saw she couldn't stand the unjust behavior. She told Yeon Hwa that it was me who ordered her to put the pin there if you are desperately want your anger out take it on me. All the Prince came there. Yeon Hwa was about to hit Hae Soo but the 4th prince interrupted you don't have any right to hit she belongs to me. His confession made everyone startled. The 10th prince also jumped in and helped Hae Soo clear her position. He told Yeon Hwa that he saw Hae So pick up the hair pin infront of 4th Prince room. The things become clear and Yeon Hwa became all irritated and humiliated infront of others. After everyone left the 8th Prince Wong Woo clear things to the 4th prince saying what do you mean by saying she belongs to me. There isn't anything here which belongs to you. It was another scene of Hae Soo encounter the 4th prince as she was wondering and roaming alone thinking why the 4th prince Wong Soo called she belongs to me. She bumped into him and was shocked. As for the 4th prince he was happy to see her. She aggressively ask why she belongs to him and the arrogant prince replied you firth should thank me that i saved you from the beating and why not you belong to me? We smiled how possessive the 4th Prince was. 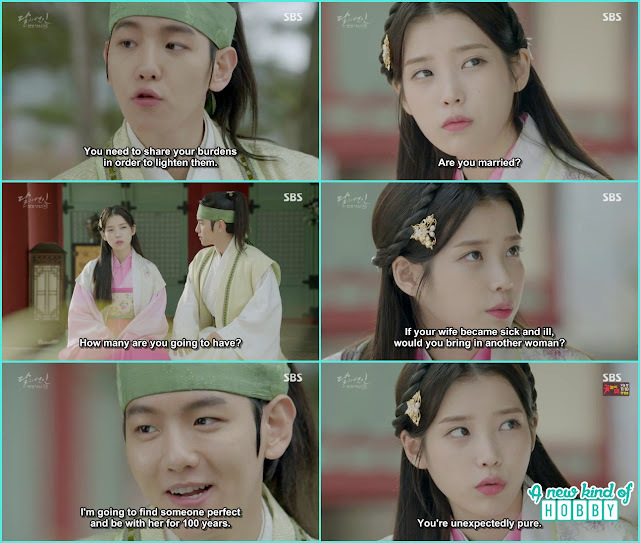 He don't want to have Hae Soo infront of him yet he confess she belongs to me. This couple will surely give us a great chemistry in the further episodes. Hae Soo was in the Town market with her maid and saw few gangster dragged the 14th Prince (Ji Soo). She send her maid to ask help from the palace and follow them. They end up in the bambo jungle. The 4th Prince Wong Soo also followed Hae Soo. The gangster was about to take the 14th prince arms as a revenge Hae Soo jumped him to safe him. But the situation become more of complicated. The 8th Prince Wong Wook came to rescue them as well. But the gangster were had large force and the three of them ended up between them. The 4th Prince came and with out using a weapon made them leave. He was known as the Wolf Dog. His presence there was enough to make the gangsters to got scared and leave on their own. The 14th Prince thank Hae Soo for saving his life and he will surely repay her back. Hae Soo hugged him as she was reminded of her little brother. Seeing both the 14th prince and Hae Soo cheering up the expression of 4th Prince and 8th Prince were like to believe it or not. The 8th Prince Wong Wook take Hae Soo back home he was angry on her and didn't take any notice of Hae Soo coming with her. She put an act that she is injured and can't walk he stopped in worry cam to Hae Soo and said Hae Soo said "I thought i had lost You ". 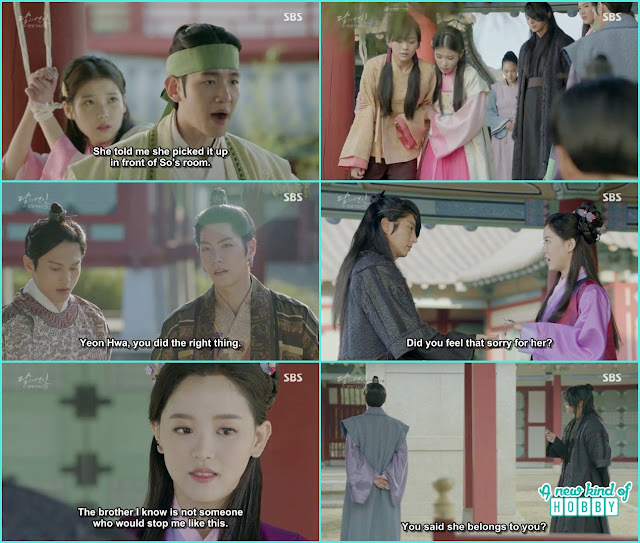 He grabbed her and was about to kiss her it was the crucial moment Hae Soo saw people from palace coming from the palace and she make herself step back from the 8th Prince. Thank God no body caught on them. Another encounter of Hae Soo with the 4th Prince Wong Soo they happened to met outside the temple. 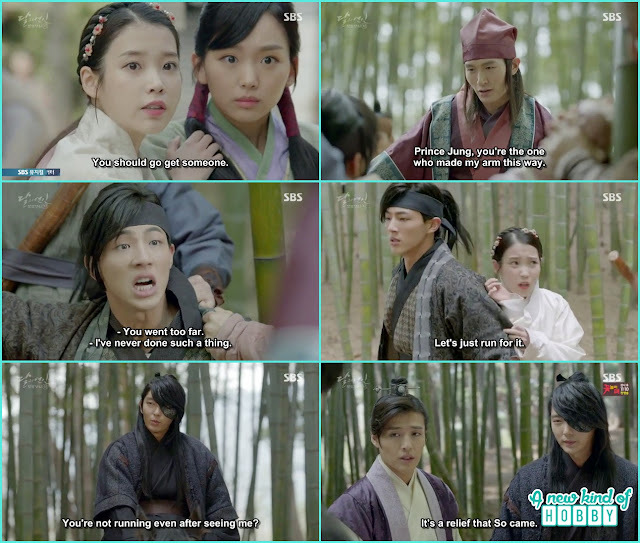 The 4th Prince told Hae Soo that she won't be running into him often as he will be living in the palace from now on. So it will there last meeting and looking at 4th Prince face we knew he will be missing Hae Soo. It was the beautiful moment, she told the 4th Prince not to have bad dreams take care of himself and avoid getting into fights. Hae Soo practically was a peaceful girl and she wanted every one to be be lik her friendly. The 4th Prince like Hae Soo caring and scolding him, he couldn't make himself stop by asking how can you not scared of me at all. Hae Soo replied its not you i am most scared of myself. The episode ends when snow starts falling. Yeon Hwa showed the witchy side of her and we were angry why in the world she is picking on Hae Soo. 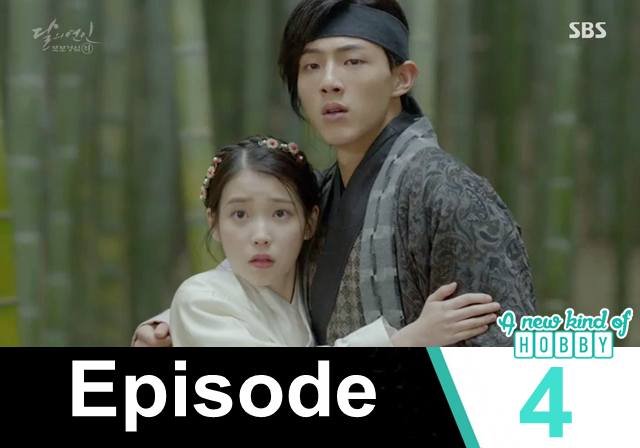 The 10th Prince along with the 4th Prince help Hae Soo rescue from her beating. 4th Prince confessed saying she belongs to me it was the blast for everyone and we were happy for Hae Soo that finally she got her knight. One of my friend who watched the chinese version of scarlet Heart Reyo told us the story but we didn't develop any interest. As for now we are watching the remake version starting Lee Joon Gi we naturally become touched by the story and their acting. We love all the encounters where Hae Soo run into 4th Prince. She also become friend the 14th Prince we were happy she gradually starts getting along with the people in gorgeo dynasty.